These are the frequencies "out of the box" if they're any use to anyone else. great little radios for the money, work well on PMR (which mine are programmed at present). Easy to program, pull in as well as they get out. I didn't do as well, I paid £15 new but like yourself I'm very impressed with it and it works well on 446 and 70cms, the audio is good and it has a nice feel, the fact that it's programable by software and not the keypad make these ideal low cost coms for businesses, especially compared to the highly expensive alternatives from the likes of Motorola, Icom and Vertex on The UK market. Testing the output mine is around 2 watt though which is fair enough. These are great little radios. I brought a pair for my in-laws for when they go travelling in their 5Th Wheel! They love them....The reception is quite clear, concidering it's not an Icom or Yaesu etc, and for the price it's pretty un-beatable! Quite difficult to sync with a PC if you are using a Prolific driver and USB cable, but that's always been a case with these type of connections.....Once a PC connection is established, it opens this little radio to a whole more features! 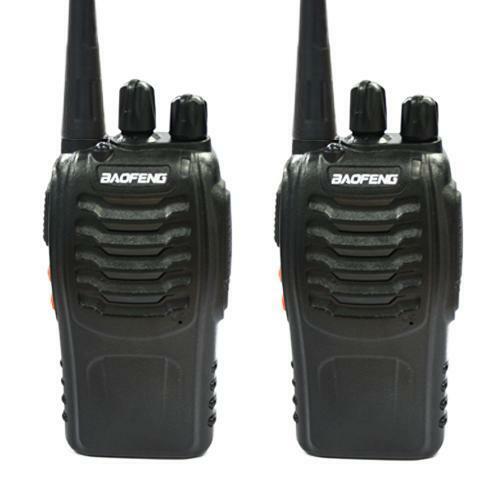 I used to own a Baofeng UV-5R and had no problems with them either. Gone to an Icom IC-E92D now to experiment with D-Star and finding it a little tricky.....Must be cause i'm old fashioned! Don't suppose you have a screen print of the UK PMR 1-8 channels and also 9-16 with CTCSS, I just ordered two 888s radios and also a couple of Motorola TLKR T50 and would like to get them talking! Any help would be much appreciated indeed, thanks! Last edited by xrayhead on Fri Jul 18, 2014 9:05 pm, edited 1 time in total. There are wide & narrow settings for FM on many radios.. Normally Wide FM is Broadcast radio with a deviation of 75KHz. But on radios like the 888 the bandwidths are set for 25khz channel (band plan) steps on wide & 12.5 khz steps for narrow. I do not know what the actual deviation is on the radio for wide & narrow, but it will be less than the step size & probably 10khz deviation & 20 khz deviation. The idea being that two radios working say a 12.5 khz band plan will not interfere with each other if the two signals do not touch in the middle of that step. So the deviation (band width of the signal) needs to be less than 12.5. So say 10 Khz which gives 5 khz of clear space between the two stations. Thus a radio set for narrow could work a 25khz or 12.5 khz step band plan, but a radio set for 25Khz on a 12.5khz band plan would interfere with the channel above & below it. In general if using an amateur radio repeater it is wide & for a PMR repeater narrow. Back to back (simplex, or radio to radio) the setting of wide or narrow makes little difference other than for interference issues & the loudness & audio quality of the signal, but when using a repeater it makes a big difference as if the deviation is to much you will clip your audio. It is called hitting the sides. Whilst if too narrow the repeater will possibly not open.